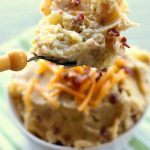 Creamy buttermilk garlic mashed potatoes with grated cheddar and bits of bacon made easy in your electric pressure cooker. A perfect side dish for your Easter dinner. Pour water into the bottom of the Instant Pot. Add in the potatoes, garlic, bay leaf and kosher salt. Cover and secure the lid. Make sure the valve is set to “sealing.” Set the manual/pressure cook button to 5 minutes (high pressure). When the cook time ends perform a quick release by moving the valve to venting. Remove the lid and test the potatoes for doneness. Discard the bay leaf. Use a colander to drain off liquid. Use a potato masher to mash the potatoes and garlic until mostly smooth. Mash in the butter and gradually stir in the buttermilk. Stir in the cheddar and the bacon crumbles. Salt and pepper to taste.